The sanctuary of Central Congregational UCC in Atlanta looks out upon 8 acres of woods, which the congregation has been working to restore. Under the guidance of a visionary minister and an energetic lay leader, Central Congregational UCC turned its overgrown 8-acre forest into a nature preserve. The payoff has been far greater than the church expected. On a hot, humid summer afternoon in Atlanta, children at Camp Beech Grove are enjoying their daily hike down to the creek. Here, in the nature preserve of Central Congregational United Church of Christ (CUCC), they find relief from the sizzling sun, surrounded by a canopy of trees -- many of them beech, the camp’s namesake. In these woods, a butterfly goes by, a frog makes a splash, and children learn about the native plants that surround them. Today, the children can enjoy all that nature has to offer here. But that hasn’t always been the case. For five years, the 450-member congregation at CUCC has been working to restore the 8 acres of woods surrounding the church. A certified wildlife habitat by the National Wildlife Federation (NWF), the woods offer a magnificent view through the floor-to-ceiling windows of the church’s sanctuary. It was there that Ron Smith, gazing out those windows, had a vision. 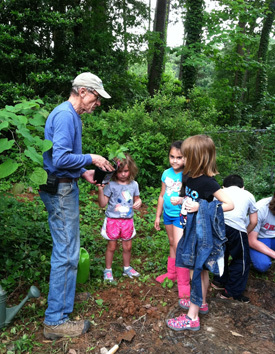 Ron Smith works with kids planting a garden. Smith set out to reverse decades of neglect and to rehabilitate the surrounding woods, where he says he can be closer to the Creator. “God is speaking in nature, and we’re losing something when we don’t make nature a part of the community or when we don’t show respect for it. He created all of this. All life is sacred, and all of nature is sacred,” Smith said. Active with the church since 2010, the year he retired from his 60-hour-a-week corporate job as a CPA, Smith knew that creating a sustainable wildlife habitat would also provide ecological benefits, including the preservation of native species and better air and water quality. What he didn’t know is that his vision would ultimately bring an awareness of and connection with the surrounding community, providing an urban oasis and a place for the church’s neighbors to be closer to God. Smith had learned to love the outdoors at a young age. He grew up in a farming area of Pennsylvania, and his mother had vegetable gardens and an infectious love of nature. From these influences, Smith said, he knew he would be a gardener when he retired. He first tackled the overgrown yard of a home he and his wife purchased in nearby Decatur before setting his sights on the distressed woods at CUCC. In spring 2011, Smith told his wife he wanted to work in the CUCC woods. He joined the congregation’s Garden Team, which meets once a month to work on the church grounds. As Smith worked, he realized that a path through the woods would not only invite people in but also provide the access needed to remove and replace unwanted plants. In what ways would this be a useful attitude in your church or institution? With no church budget, Smith personally purchased the first equipment and plants and began clearing a path to the creek, thinking, “If I build a trail, people will come.” And he was right. Since then, much has happened to the neglected wooded area. Nature trails have been created. Trash and debris have been removed from the creek. Invasive plants -- aggressive species that grow outside their natural range and crowd out the native plants -- have been removed and replaced with species indigenous to the area. Meadows and gardens have been established. Over time, more people from the congregation have showed up to help: working, bringing plants or donating money. Local businesses and nonprofits have joined the effort, too. In 2012, Trees Atlanta donated 40 trees, while Hands On Atlanta sent 30 volunteers to help plant, clear ivy and mulch trails. Members of the Native Plant Society have also donated trees and shrubs, helped Smith identify appropriate grasses for the creek area and assisted with transporting the plants. The Garden Team and its supporters continue to invest their time and money to support the forest restoration and gardens as well. And this past spring, reinforcements were brought in -- 12 sheep stayed for two months, eating the English ivy that overran the grounds. This literal flock was a big hit with the metaphorical one. 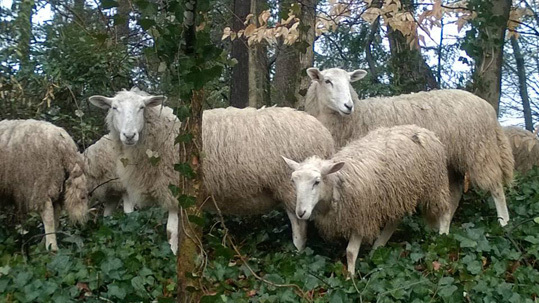 Sheep love to eat ivy, which is an invasive species that needed to be removed. It’s bridging this separation from nature that inspires Smith and Ferrell to continue their efforts and watch the project evolve. At this liberal, progressive, mission-oriented church, Ferrell says, there’s a history of people wanting to worship in a natural setting. When the CUCC congregation moved from downtown Atlanta in the late 1960s to what was then considered the suburbs, it chose to build the church in the middle of an 8-acre forest. Today, that property is surrounded by an urban landscape. It’s just minutes from downtown, located on a major four-lane road. The congregation continued to enjoy the leafy view from the sanctuary, but over time, the land -- like many urban forests -- became overgrown. Every urban woods, forest and preserve fights invasive plants, Smith said; the deterioration is slow and organic. The church started to take notice and reverse this decline shortly after Ferrell joined CUCC in 2008. What natural resources could your institution protect, nurture, share or explore in order to cultivate a sense of wonder about God’s creation? Wanting to create manageable volunteer opportunities to help with care for the church’s gardens, Ferrell established the Garden Team. The team divided the land into 35 sections. Members were asked to adopt a section, which they tended on their own time. This worked well, and the team took steps to have the forest designated as an NWF wildlife preserve. This is significant, Smith said, because the certification is a badge telling people the land has intentionally been set aside to be cared for in order to provide refuge for wildlife. 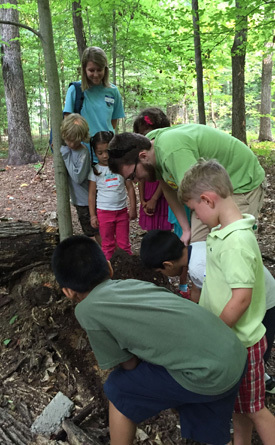 Children examine life under a log. Now, on any given day, members of the church and surrounding community can be found walking the nature trail, which starts at a memorial garden just outside the sanctuary. At the creek, 700 feet down the path, they’ve built a fort for children out of the remnants of Chinese privet, an invasive plant that was removed from the forest. Girl Scouts and Boy Scouts spend time in the woods, now referred to as the nature preserve, to plant, work on trails and visit the award-winning pollinator garden, which is designed to attract insects that feed on and pollinate surrounding plants. Children, from the on-site preschool and the summer camp, are out in the woods almost every day of the year. This, according to Ferrell, is how it should be. Worship and outreach are amplified to include the earth, she said. “When we walk out into a forest or step into a creek, we are reminded that we are a part of the natural world,” Ferrell said. “Our time watching a bee sleep on a flower or a goldfinch sitting on the tiniest stem brings us in touch with the gifts of our Creator. The forest helps us to remember the incredible gift of life, all life, on this planet. 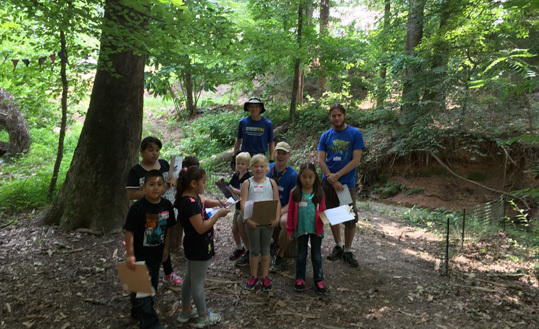 Children at Camp Beech Grove take a nature walk near the restored creek. According to Richard Louv, the author of “Last Child in the Woods: Saving Our Children from Nature-Deficit Disorder” and co-founder of the Children & Nature Network, the answer is yes. “Smart religious leaders of all faiths, and many nonbelievers as well, intuitively understand that all spiritual life begins with a sense of wonder, and that sense is usually formed early in childhood, often in natural settings. Most religious traditions and, especially, indigenous cultures offer ways to discover the divine in the natural world. In these cultures and faith-based communities, individuals, families and religious organizations can play an important role in helping children and adults know the world and beyond through nature,” Louv said. There is also an expanding body of scientific evidence linking experience in the natural world to better physical and mental health and enhanced cognitive abilities, Louv said. How can we tap into this for ourselves and our children? The answer, according to Louv, is to rethink nature within cities. And CUCC is doing just that. When Smith looked out the sanctuary windows that Sunday in 2011, his desire was to heal the earth. But this mission has also helped the congregation cultivate relationships in the community, largely through the preschool and the summer camp. 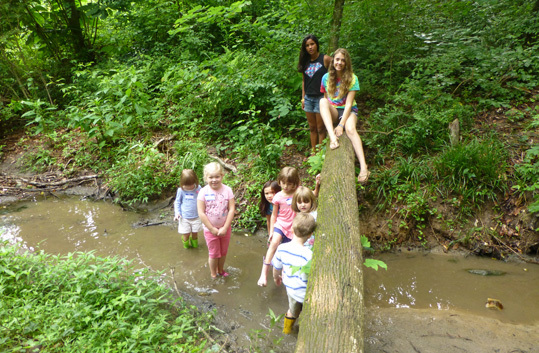 Children at the creek in 2014, before the invasive plants were cleared and replaced. Since 2012, the church has hosted Turning Sun School, a place-based preschool that emphasizes the local community and natural environment as an extension of the classroom. The children have fun with activities such as the fall lantern walk, a nighttime family hike along the trail, illuminated by lanterns they have made, and the spring fairy breakfast, for which they create their own fairy houses. Ferrell echoes this sentiment, which is why she, along with the CUCC Board of Christian Education, created Camp Beech Grove, a summer camp offering six one-week sessions focused on learning about the outdoor world and the sacredness of creation. For years, Ferrell and the board discussed this idea, hoping to create a way for children and families of the community to be connected to the church, and after five years of rehabilitating the nature preserve, Ferrell knew they could offer something great. The camp, held in June and July, had 61 campers this first year. The church offered 45 scholarships to children in a nearby neighborhood. 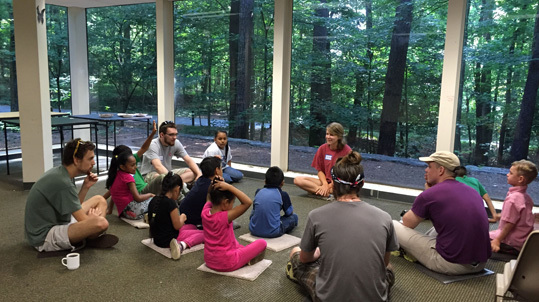 Campers began each morning with a sacred story before a daily hands-on nature lesson. This type of learning was especially beneficial to 6-year-old Gabe Narducci, who attended all six weeks of Camp Beech Grove. Storytime at Camp Beech Grove in the indoor church space. And Camp Beech Grove is just a first step. As the project continues to evolve, Smith has plans for more trails and gardens, including a community vegetable garden, where neighbors can participate in growing their own produce. Ron Smith began his work on a path through the woods surrounding his church by thinking, “If I build a trail, people will come.” In what ways would this be a useful attitude in your church or institution? Why did this nature preserve project attract the attention and resources of the wider Atlanta community? What project are you excited enough about to share with your community? Smith and the Rev. Ginnie Ferrell note that the woods foster a sense of wonder. What natural resources could your institution protect, nurture, share or explore in order to cultivate a sense of wonder about God’s creation? What resources -- natural or made by people -- are abundant in your setting or organization? How might you use them to cultivate a thriving community?